How best to compound our money when restricted by a small market. There’s little room for lazy balance sheets and poor management in America. A review of the key lessons from investing in this industry. Management makes a difference in the crowded world of mining engineering. The Forager Australian Shares Fund risks getting too big for its boots. Almost seven years ago, I hoped to one day be able to write this letter to you. A potential investor at one of our first ever roadshows asked me how much money we thought we could effectively manage in Australia. My answer — $150m to $200m — seemed a long way from the $10m or so we raised in those first few months. It seemed even further away a few years later when the fund was still less than $20m and the return since inception had a minus sign in front of it. Most funds management businesses fail. So I feel incredibly fortunate and proud to be writing to you telling you that those capacity constraints have started to bite. 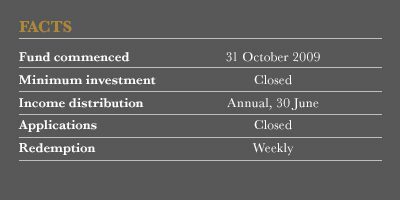 At the end of September, we were managing roughly $160m in ASX-focused funds. The return to investors in the Forager Australian Shares Fund over the past five years has been 24.3% p.a., lifting the since-inception number to 167%. Someone who invested $100k with us when we first passed around the hat has $267k today, and that is a meaningful difference to many of our clients’ retirement plans. Now, however, we have some important decisions to make. Unfortunately, the Australian market is small. With $160m to invest in ASX-listed companies, we immediately cut the universe of potential stocks from 2,000 to less than 800 (using a cut-off of $100m market capitalisation). Less than 400 of these have a market capitalisation greater than $1bn, and the competition among fund managers for these small number of stocks is fierce. 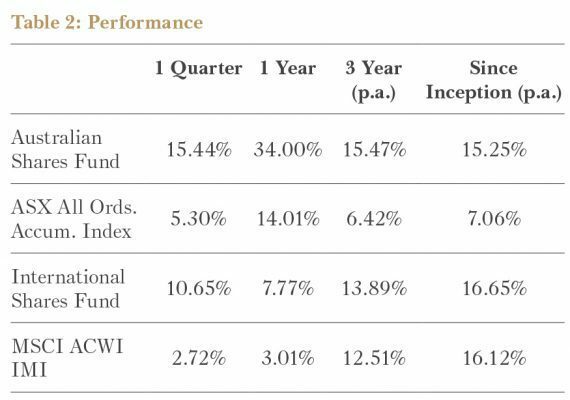 To be any chance of replicating historical performance, the Fund needs to stay small and nimble. So we have decided to cease accepting further investments into the Australian Shares Fund. Clients were notified in early August and the last applications and additional investments were processed on 7 October. 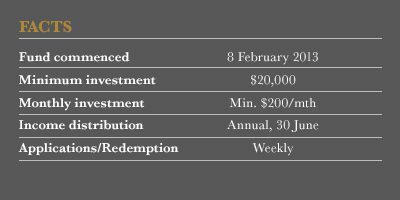 By keeping the Fund to less than $200m, we can hopefully keep performing for those investors who have supported us over the long term. The second big decision is one for investors in the Australian Shares Fund to make over the coming months. 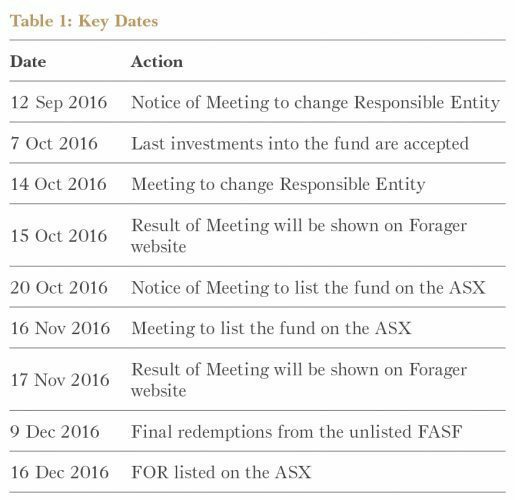 We have put a proposal forward to convert the Fund to a closed-end trust and list it on the ASX. This would remove the existing ability for investors to redeem their units, instead allowing them to buy and sell units to and from each other on the stock exchange. 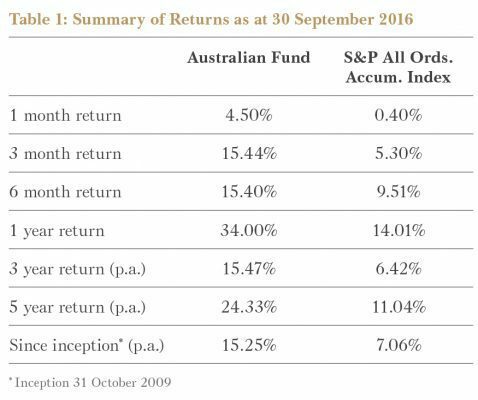 The Australian Shares Fund’s results have been stellar over the past five years but there are a number of funds management firms out there that have produced similar or better results. The interesting facet is how few of today’s exceptional funds were in existence prior to the financial crisis. Most of them are new, and have only operated in buoyant markets (particularly buoyant at the smaller end of the market). I want this fund to survive and prosper in difficult and dysfunctional markets, too. In fact, our long term legacy will likely be defined by those difficult times. Removing the risk of redemptions clearly enhances our ability to prosper in difficult times and removes the risk of the vehicle itself being vulnerable in extreme scenarios. We have recommended this proposal to investors and, while this is not the place to re-iterate all of the pros and cons of the potential listing, it is my belief that there will come a day where we look back on this as one of the most important decisions we have made. Some investors have suggested to me that restricting the size of the Australian Fund is a wonderful idea, as long as they are allowed to keep investing. Others have suggested we start another fund to invest in smaller companies. Nudge, nudge. Wink, wink: “just my money and yours”. Hopefully you know me better than that. I’ve invested my money alongside yours since day one and that isn’t going to change. We won’t be running one fund for fees and another for returns. But we do have a problem. I am 38 years old and want to grow my wealth for many decades yet. If we are already capacity constrained in Australia, how are we going to keep compounding our money? The solutions are straight forward. Our expertise is in equities, which means there isn’t any point looking at other asset classes. So we can either find bigger companies to invest in, or find other markets in which to do what we have done historically in Australia. SIZE KILLS PERFORMANCE IN FUNDS MANAGEMENT. EVEN THE GREATEST INVESTOR OF ALL TIME, WARREN BUFFETT, HAS SEEN HIS RESULTS REVERT TO THE MARKET AS HE HAS BEEN FORCED TO BUY LARGER AND LARGER COMPANIES. Size kills performance in funds management. Even the greatest investor of all time, Warren Buffett, has seen his results revert closer to the market as he has been forced to buy larger and larger companies. If we are forced to invest in larger companies, our returns will almost certainly suffer. But I am increasingly confident that the Forager International Shares Fund is a place where we can compound our money at attractive rates for many years to come. Yes, we have trodden carefully. Yes, we have owned some large blue chip companies where we are unlikely to have an advantage over competitors with armies of analysts. Finding good ideas takes time, though. And the important thing is that, as we have found ideas where we think we have an edge — smaller, unloved and neglected ideas — the performance of those stocks has been extremely encouraging. Indeed, the International Fund passed a small milestone of its own this quarter. The return since inception is now ahead of the index. That might not sound like a lot in a world where you can get index returns for very low fees. But we held very high cash balances in those formative years, punishing during a raging bull market. We have caught up a lot of lost ground over the past couple of years. And, in stark contrast to Australia, it has been in a market where the vast majority of active managers are vastly underperforming the market. have dramatically underperformed the rest of the market, meaning even the monkey with its dart board is showing outstanding relative performance. An equal weighted index has outperformed its market capitalisation weighted counterpart by 9% over the past two years. In the largest international market, the US, the opposite has been true. Significant outperformance by global tech giants Facebook, Amazon, Netflix and Google has meant the index left most active investors in its wake (as you can see in the chart below, equal-weighted has underperformed by 2%). Along with some help from South32 and eBay, stellar results from small companies like El.En, Lotto24, Kapsch TrafficCom and Cable One (see Cable Blazes a New Trail below) has made our Fund one of the few doing better than benchmark over recent years. We need to find more of similarly attractive investment ideas but the evidence is growing that fear and greed are just as prevalent in the seven billion non-Australians on the planet. We need time and experience but when we find good ideas, the results can be just as good as those at home. I don’t expect anyone to take my word for it. The proof will be in the pudding and the pudding won’t be baked for many years yet. I still expect it to take a decade to prove ourselves on the international investing front. Only three and a half years into that journey, you should still be sceptical. The point is simply that the size of the Australian market is severely restrictive. If we are successful compounding wealth at a healthy rate over the next few decades, a good chunk of it is going to end up invested outside the ASX. By the time we write the next quarterly report, I hope to be addressing unitholders in a listed Forager Australian Shares Fund. While it would be an important milestone, you should not expect anything dramatically different from us. We’ll be out there looking for ideas, trying to replicate the historical performance and communicating as clearly as possible what we are doing with your money. Your support, patience and long-term focus have been instrumental in the success of Forager to date. I sincerely hope it stays that way. The portfolio has rebounded strongly since a Brexit-induced slump in the last week of June. For the most part, though, it hasn’t been the Brexit stocks doing the bouncing. In our annual performance report for the year to 30 June, we lamented the damage in inflicted by Britain’s vote to leave the European Union. That’s not because share prices had fallen— low prices are a good thing. Rather we felt that some of our most important investments had been performing exceptionally well, but that this was being masked by large falls in Brexit-exposed stocks. All of that and then some was reversed in the September quarter, almost without assistance from the aforementioned Brexit stocks. We did add one new UK stock to the portfolio in the quarter that rallied strongly after we bought it, but Lloyds Bank (LSE: LLOY) is trading just 10% above its June lows. Countrywide (LSE: CWD) and Foxtons (LSE: FOXT) are still bouncing along the bottom. Outstanding results being reported elsewhere, though, mean the portfolio is humming along. 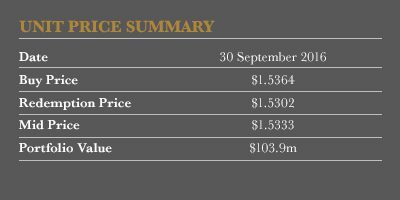 Highlights outlined in recent monthly reports included eBay (Nasdaq: EBAY), Sotheby’s (NYSE: BID) and Kapsch TrafficCom (WBAG: KTCG). The thesis on Cable One (NYSE: CABO) has been unfolding to plan and South32’s (ASX: S32) management team continues to show it has a healthy future as an efficiently run, low-cost miner. A decent correction would still be welcome. As pointed out earlier, though, the gradual transition towards a more concentrated portfolio of mostly smaller stocks is working. Providing cable service sounds like a boring business. It is a boring business. But one US company is shaking up the industry by doing the unthinkable: shifting focus from pay-TV. We bought shares in the company, Cable One, late in 2015. Cable One provides a full suite of communications services to more than 400,000 consumers and business customers. It differs from most cable companies in the US in a number of respects. Due to the massive fixed cost investment required, most cable companies focus on selling into dense population centres. But Cable One has eschewed this strategy and focused on more rural regions. By doing so, it avoids competition with the telecom carriers who have ploughed into the city markets with their own pay-TV services. More audaciously, Cable One is all but abandoning the traditional pay-TV business. This flies in the face of conventional wisdom. Management argues that its programming costs prove too great when selling to its more rural customer base. To combat these unfavourable economics, it’s been jacking up prices on its video service, knowing it will alientate many subscribers. It has also been unafraid to drop popular channels that have raised prices too aggressively. For decades, cable television was a must-have in America. But the rise of digital video has dramatically altered the landscape for media consumption with far reaching consequences for companies providing the traditional cable bundle. Many Americans are choosing to cancel or shrink their cable subscription and many new households are avoiding signing up in the first place, favouring cheaper streaming services like Netflix. Fortunately for cable providers like Cable One, pay-TV service is not their only product. They also happen to be the dominant providers of broadband internet, and that has given them a lifeline. Cord-cutters still need the internet, perhaps even more so, and the cable companies are figuring out how to shift the dollars they collect from video to internet subscribers. Cable One’s management has invested heavily over the past several years in one of the most powerful digital networks in the country. As recently as 2015, the average speed of its network was 50Mbps. After completing its upgrade, it now offers speeds up to one gigabit per second. It’s impressive, especially for small-town internet. We expect its customers will be willing to pay more for faster, better internet over time. They’ll need it for their Netflix. As a quasi monopoly within most of its geographies, Cable One is optimally positioned. MORE AUDACIOUSLY, CABLE ONE IS ALL BUT ABANDONING THE TRADITIONAL PAY-TV BUSINESS. THIS FLIES IN THE FACE OF CONVENTIONAL WISDOM. Besides securing its future, the transition from pay-TV to internet will benefit Cable One’s financials as well. The company enjoys healthy double-digit margins already. But providing internet service is around four times as profitable per dollar of revenue when compared with pay-TV distribution. As revenue shifts to this more profitable product, the improved cashflow will be good for shareholders. Cable One also represents a strategically valuable asset. In most markets in which the company operates, it competes only with the local telecom provider in offering broadband internet. But it typically dominates market share with a much better, faster service. We think owning the internet connection direct to the consumer should become more valuable over time. In addition, the cable industry has seen major consolidation as the big operators look to capture greater economies of scale. Cable One should prove an attractive target. This is a steady, predictable business that has stood the test of recessions past. It’s backed by a bold and creative management team. The stock is up 34% on the Fund’s average purchase price but even from here the stock is likely to deliver an attractive return for the risk involved. When the diamond market suffered a mini collapse in 2015, we snapped up shares of the global leader in diamond processing technology. Sarine Technologies (SGX: U77) is headquartered in Israel and listed in Singapore. It sells machinery and related software involved in all facets of processing rough stones into polished diamonds. Sarine traces its roots back to the 1980s when a group of gemstone traders formed a company aimed at bringing automation to the gem processing industry. Historically, working out the most efficient and profitable way of cutting a rough diamond was a manual process, dependent on many hours of labour by a highly skilled technician. Over the years, Sarine’s technology has reduced the reliance on human labour while substantially improving manufacturing yields. For example, whereas a top-notch diamond cutter could harvest two or three polished diamonds out of an average rough stone, the company’s machines can get between ten and twelve. Sarine sells its products into a highly fragmented market of over 5,000 businesses around the world. Its most important product line, the Galaxy system, performs a scan of a rough diamond mapping all inclusions in the stone. As part of Sarine’s service, the scan is analysed and a plan is designed that maximises the value of the diamonds to be cut from the rough stone. Every time one of its customers processes a diamond with one of its Galaxy machines, Sarine earns a fee. We were highly attracted to this aspect of the business model — the recurring, fee-based revenue is exceptionally profitable. FROM 2001 THROUGH 2014, SARINE'S REVENUE AND PROFIT INCREASED TENFOLD. AS ONE OF ONLY TWO SUPPLIERS OF THIS TYPE OF TECHNOLOGY IN THE WORLD, IT DOMINATES THE INDUSTRY WITH 70% MARKET SHARE. The company has grown impressively over the past 15 years. From 2001 to 2014, Sarine‘s revenue and profit increased tenfold. As one of only two suppliers of this type of technology in the world, it dominates the industry with a 70% market share. This scale advantage should enable it to out-invest its main competitor in research and development, resulting in better products in the future. As mentioned earlier, 2015 was a difficult year for the diamond industry. The crackdown on corruption in China significantly dampened one of the largest diamond markets in the world. An even bigger headwind involved a dispute between diamond miner De Beers and the manufacturers and wholesalers who purchase its diamonds. After getting fed up with one too many price increases, the manufacturers went on strike and refused to buy new stones, severely curbing processing volumes. 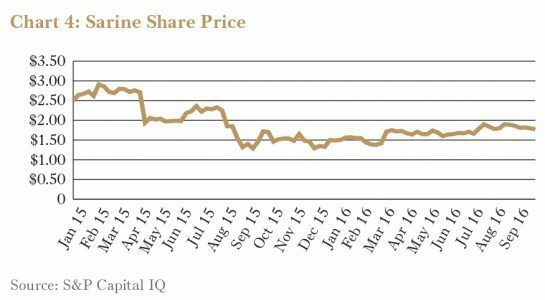 Since Sarine’s business is directly exposed to diamond volumes, results suffered and its share price halved. That’s when we got involved. Most of these issues should prove temporary, with industry-wide volumes recovering at some stage. Bolstered by a clean balance sheet, the company has several new products that could provide further growth. Management owns a meaningful stake in the business and pays out much of the cashflow as dividends. Since investing, the share price has climbed 14% despite only modest improvements in the diamond markets. The company’s results continue to lag historical levels as the industry deals with reduced volumes. We remain patient. A turnaround will take time but we’re pleased to own this hidden gem. In January the Fund invested in venerable fine art auctioneer Sotheby’s (NYSE: BID). The company provides a marketplace for unique art. Sellers are assured of receiving their sale proceeds and buyers about the authenticity of their purchases. Sotheby’s also advises sellers on complex transactions, such as liquidations of large estates, and provides financing services to buyers. Its only major competitor is Christie’s. Network effects are a meaningful source of competitive advantage in this industry. Sellers auction their items at Sotheby’s because of the large number of bidders attending its auctions. Bidders flock to Sotheby’s because that’s where they can find the best items. Scale is also important in this global market. Not surprisingly, Sotheby’s and Christie’s each have a 30% share of the US$20bn art auction market (excluding China). This cosy duopoly should ensure that competition remains tame and profits high. While those dynamics contributed an average return on equity of 20% over the past decade, returns have deteriorated recently. Both companies have been battling hard for market share, mainly through the use of auction guarantees, where the auction house promises sellers a minimum price no matter what the outcome of the auction. 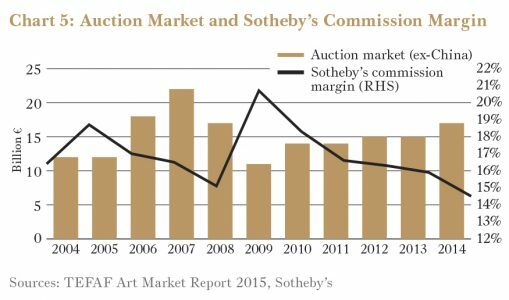 As chart 5 shows, losses on these guarantees contributed to a decline of Sotheby’s commission margin. The margin declined from a peak of 20.7% in 2009 to 14.7% in 2014 despite a buoyant art market. While the company generated a profit of $2.50 per share in 2011, it made only $2 in 2014, and that’s after adjusting for ‘one off’ costs. If this weren’t enough, expectations of a cooling art market weighed on the stock too. Sotheby’s share price halved from $50 in 2014 to about $25 at the beginning of this year. When Forager invested in it, Sotheby’s had a market capitalisation of US$1.5bn. Its net tangible assets were US$1.1bn, mostly in the form of cash and prime real estate in New York and London. A LOW VALUATION NEVER GUARANTEES A GREAT INVESTMENT RETURN (THOUGH IT USUALLY HELPS). FOR THE INVESTMENT TO SUCCEED, WE NEEDED SOTHEBY’S MANAGEMENT TO LIFT ITS GAME. Sotheby’s competitive advantage in art auctions arises from its client lists, brand name and expertise, none of which are accounted for on its books. So those tangible assets looked superfluous and potentially able to be returned to shareholders. We also believed that the shrinking margin was self-inflicted and easily fixable as a result. And that the business’s flexible cost base meant it could withstand a severe correction in the art market. The $400m excess over its tangible assets looked a steal for such an entrenched business. The stock was clearly cheap. Nevertheless, a low valuation never guarantees a great investment return (though it usually helps). For the investment to succeed, we needed Sotheby’s management to lift its game. And for the board to consider capital management actions. We took a measure of confidence from the involvement of two activist funds, Third Point and Marcato Capital, which collectively owned 20% of the company and were pushing for board and management change. That confidence was well founded. Since June last year Sotheby’s has repatriated some of its overseas cash to the US and suspended its dividend to focus on an accelerated share buyback. The company had to pay some tax, but the share count has decreased by a whopping 22% as a result. Concurrently, activist-backed CEO Tad Smith seems to have put an end to the abuse of auction guarantees. The commission margin has recently recovered to 16.4%. The combination of a lower share count and margin improvement enabled Sotheby’s to earn a profit of $1.52 per share in the second quarter of 2016, well above Wall Street’s expectation of $1.05. As a result, Sotheby’s stock price has recovered significantly. The Fund recently crystallised a 65% return on its investment in just over six months. This investment illustrates why there’s little room for lazy balance sheets, poor management and complacent boards in America. In the land of shareholder activism, leveraged buyouts and spin-offs, capitalist forces quickly locate and eradicate sources of inefficiency. Unfortunately we don’t see enough of this in Australia. Institutional investors are reluctant to rock the boat. In general there is too much value locked up in companies where management is apathetic. While this is true of the Australian market, the situations in Europe and Asia are even worse. While a substantial proliferation of investment activism can paradoxically decrease the number of investment opportunities available to value investors like Forager, we’re a long way from that happening anytime soon here in Australia. Let alone in Europe and Asia where an increase in investment activism would be most welcome. As sentiment towards mining and mining services turns positive, we review the mixed performance of the Fund’s exposures and outline why GR Engineering stands above the pack. Learning from mistakes is important. It also isn’t as straight forward as it sounds for long-term investors. We often have to wait years to get feedback on our investing decisions. And once we have that feedback, it is fiendishly difficult to separate skill from luck. Was buying Whitehaven Coal (WHC) at $0.39 in January a good investing decision? Was selling it at $0.78 a few weeks later the right thing to do? The share price closed at $2.45 on 30 September, so the former looks like a stroke of genius and the latter an act of stupidity. Whitehaven is a highly leveraged coal miner. Our view in January was that it may go bust, or it may be worth a lot of money, but on a probability weighted basis the low share price was an interesting opportunity. 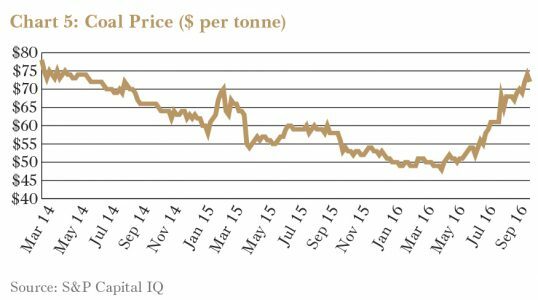 The coal price has doubled in the six months since (see chart 5) and, if it stays at these levels for a couple of years, Whitehaven could repay a lot of debt very quickly. The upside case is playing out, for now. But did we get the probabilities right at the time? We don’t know. You never do. Which brings us to the Fund’s mining-related investments. Over the past six months, investor optimism has returned to the sector. 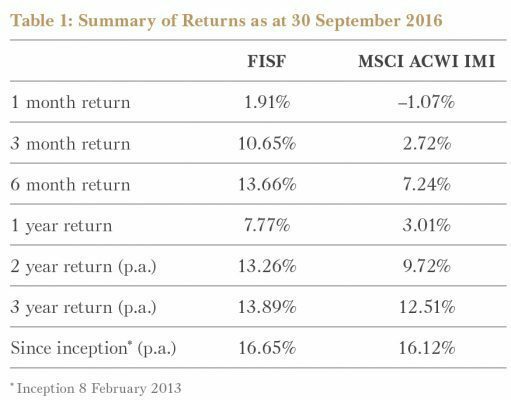 Share prices are up a long way and, on average, the Fund has made excellent returns. It’s an appropriate time to reflect on what lessons, if any, should be learned from our foray into this previously unloved sector of the market. Starting with what can be learned from mistakes, by far the two most disappointing mining services investments have been Hughes Drilling (HDX) and Brierty (BYL). Hughes’s woes culminated in the company being placed into voluntary administration during September. While recapitalisation proposals may emerge, the existing equity is now worthless. When we first invested in this company in 2013, it had net debt of $22m and had generated $10m of profit. With the expansion of its fleet of rigs, we anticipated $12m profit in 2014 and a lower net debt number. This future never materialised. Following a debt fuelled expansion binge over the next two years, net debt blew out to $45m while profit halved. Unsurprisingly, a day before the company was placed into administration, its auditors notified ASIC that they suspected Hughes’s directors had contravened the Corporations Act. Like Hughes, Brierty’s wounds were self-inflicted. In 2014, the company had net cash on its balance sheet and made a $10m profit in 2014. That turned into a $48m net debt position and a $50m loss by 2016. Just one bad contract was largely responsible for the company’s Civil division reporting a $31m loss before tax in 2016. It is at serious risk of joining Hughes in the mining services graveyard. Both companies have significant insider ownership, which shows that skin in the game won’t always save you. But they do show how important management is in this business. Understanding return on capital is paramount. And it is a business where one bad contract can send you broke, so having the right person signing deals is more important than usual. WE OFTEN HAVE TO WAIT YEARS TO GET FEEDBACK ON OUR INVESTING DECISIONS. ONCE WE HAVE THAT FEEDBACK, IT IS FIENDISHLY DIFFICULT TO SEPARATE SKILL FROM LUCK. Reiterating the management lesson, one of the best examples of success is MACA (MLD). We acquired a stake in MACA in June last year, paying $0.81 per share. The company performs contract mining for small to mid-tier miners mostly in gold and iron ore. Driven by negative sentiment on a falling iron ore price, MACA’s share price collapsed well before its results deteriorated. MACA has been able to replace some of that with work from small and mid-tier gold miners. At its 2016 financial year result in August, revenue was some 20% lower than its record 2015 financial year, but MACA has been able to stabilise the business at that level and maintain margins. This year’s share price performance is a testament to the company’s management team’s ability. It’s navigated the business through the downturn while maintaining a $42m net cash position and generating $40m of free cash flow in 2016. During the quarter the investment in MACA was completely exited. Its valuation was no longer compelling, with the stock looking fully priced. It was sold at levels that were roughly double the Fund’s entry price last year. If MACA was the good, Hughes and Brierty the bad, then Macmahon (MAH) would be the ugly. Macmahon remains one of the largest investments in the Fund. It’s very cheap, on both an earnings and an asset basis, but the business still has its problems. It is probably the best example of the cash these mining services businesses can generate as they shrink. Our thesis here was that the accounting profits would be woeful but that, given it didn’t need to buy any new equipment for several years, Macmahon would generate oodles of cashflow. That has largely played out and the company balance sheet now shows net cash of $56m, compared with net debt of $56m at the end of the 2014 financial year. Unfortunately, that cash isn’t coming out to shareholders any time soon. Over the past year Macmahon lost $13m on a new contract at Newcrest’s (NCM) Telfer mine and expects to lose another $10m over the next six months. Telfer isn’t Macmahon’s only problem. It is currently losing $0.5m per month in Nigeria. While management wants to leave this region, it could incur a $2.5m exit payment. On top of this, adverse currency movements would result in a further $8m of plant and equipment write downs. Although profitable, Macmahon has been a frustrating investment to date. The company should be generating $20m of profit a year, instead of the $1m reported in 2016. We are prepared to give this management team some leeway, and a takeover offer from the company’s largest shareholder CIMIC (CIM) is still a possibility. The lesson is that most of the variability in these businesses is to the downside. The best case is that a contract delivers the profit expected when it was tendered, but it is only downside from there. One of the Fund’s most recent investments in the mining services industry, was in GR Engineering (GNG). It is turning out to be an excellent business. GR has been able to carve out an attractive niche for itself within the highly competitive engineering sector. The company specialises in designing and building mineral processing plants for a fixed price. Most of its clients are junior miners that happily outsource these risky projects to a specialist. Even if that means paying a bit more. Drawing on decades of experience, GR has been able to consistently avoid cost overruns and time delays. And, so far, it hasn’t had to deal with any contract disputes, mediation, arbitration or litigation. Thanks to this excellent track record, the company often wins additional work from old clients to carry out plant modifications, upgrades and expansions at a later date. The only major competitor in Australia is Sedgman, now owned by CIMIC. Market shares vary year by year depending on contract wins, but generally the two companies have a 25% share each. 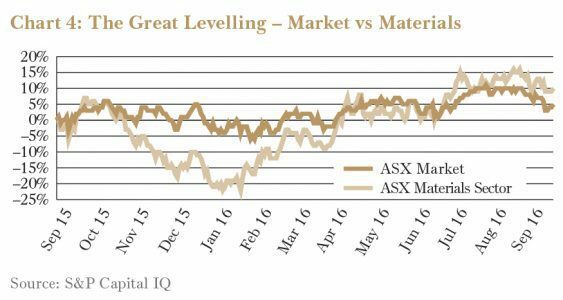 While Sedgman dominates the coal segment, GR dominates the gold segment. As Chart 3 shows, revenue can swing wildly depending on the state of the mining sector and large contract awards. Since listing in 2011, annual revenue has ranged between $110m and $217m. But despite this inherent volatility the business has proven resilient. Since bottoming at $10m in 2013, profits have averaged $18m per year and have been increasing despite a weak mining environment. Importantly, contrary to the other mining services businesses in the portfolio, GR doesn’t require much capital to grow. Since 2011 GR has outlaid only $6m in capital expenditure and paid $77m, nearly all of its profits, to shareholders in dividends. BIDDING FOR WORK AT A FIXED PRICE IS NOT FOR EVERYONE. AS FORGE GROUP’S COLLAPSE SHOWED, A COUPLE OF BAD CONTRACTS COULD BE ENOUGH TO BRING THE WHOLE BUSINESS DOWN. More often than not it’s the industry structure that best explains shareholder returns in the long term. But in GR’s industry good management is paramount. Bidding for work at a fixed price is not for everyone. As Forge Group’s collapse showed, a couple of bad contracts could be enough to bring the whole business down. On this front GR is well served. Management has decades of experience in managing such projects and an impressive history of creating value for shareholders. Instead of diversifying the business across many sectors, GR’s management has been focusing only on building processing plants for miners. Over and over. This specialisation forms the backbone of the company’s competitive advantage as it allows it to price contracts accurately. Management, though, has still been able to reduce the business’s risk profile. GR has expanded its service offering over time to include an increasingly large number of different commodities. This ensures that GR can continue to win work even if the state of a particular commodity market deteriorates. Also, in 2014 GR acquired Upstream Production Solutions. This business is run separately from the core engineering business and mainly provides operational, maintenance, and well-management services to the oil and gas sector in Australia and South East Asia. GR bought this business opportunistically from a large corporation that needed to sell it quickly. Upstream Production Solutions had $5m of net working capital at the time, was generating about $30m in revenue and $2m in profit before tax. The purchase price of $6m was a steal. Currently there are an estimated $1.5 billion worth of projects being tendered to the market. GR has completed 30 consulting jobs in 2016 and is currently working on another 15. This has historically been an accurate leading indicator for subsequent contract awards. We expect GR to win its fair share of work, especially in the gold segment, where it has historically been the leading player. GR’s mineral business should be able to generate around $200m in revenue and earn $20m in operating profit this financial year. 2018 should be another good year. Beyond that it’s hard to say. But the oil and gas business, Upstream Production Solutions, should help to mitigate this lack of visibility thanks to its larger focus on operational and maintenance types of work. This business should generate at least $65m in revenue per annum over the next three years based on current work in hand. 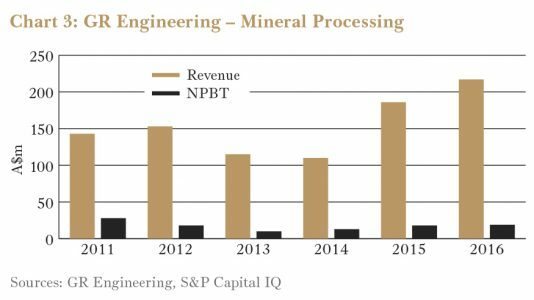 While margins are lower than those of the mineral business, Upstream should generate at least $5m per year of operating profits during this period. GR currently has a market capitalisation of $240m and $65m in net cash. Its price to earnings ratio and dividend yield are 13 and 6% respectively. Despite the stock price nearly doubling since the Fund’s purchase, these valuation metrics are not demanding for a well-run business that should grow over the coming years. Directors and senior managers own more than 50% of the company. So we expect that they will continue to run it prudently and allocate capital sensibly. Despite this, and the strong balance sheet, bidding fixed prices remains a risky business and so position sizing is critical. Currently, 4.5% of the Fund is invested in GR and we think that this is appropriate. The first nine months of 2016 have seen an extraordinary rebound in sentiment towards commodities. Miners and the contractors who service them were the most out of favour part of the market at the start of the year. A large chunk of the best performing fund managers from 2012 to 2015 had a simple strategy. Short mining, long everything else. WAIT AND SEE IS NOT AN OPTION. MANY INVESTORS WANTED TO SEE A RECOVERY IN THE COAL PRICE BEFORE BUYING COAL MINING STOCKS. BY THE TIME THAT HAPPENED, SHARE PRICES HAD ALREADY TRIPLED. Sentiment was so bad that Chinese coal miner Yankuang established an e-commerce platform. Its new goal? To sell Australian beef, milk powder and vitamins to mainland Chinese consumers. In China, a tonne of coal had become cheaper than a tonne of water. Negative sentiment led to valuations that implied disaster scenarios. A number of mining and mining services stocks were trading at large discounts to book value. Some were trading at cash backing or even less. And this provided the opportunity for those with intestinal fortitude. As mining stocks and commodity prices began to rally, the initial market reaction was disbelief. In March, one large broking house believed that the rally was running ahead of reality and downgraded a number of its recommendations. Fast forward to today and sentiment is turning. Brokers have almost universally revised their coal price forecasts higher. Much higher. Anywhere from 25% to 65%. Just three weeks ago, the above mentioned broker materially upgraded its commodity price forecasts as well as its recommendations for those same stocks it had downgraded six months earlier. South32’s (S32) share price was $0.89 on 21 January. While the company is well diversified by commodity, coal is one of its largest exposures. The stock price closed the September quarter at $2.41, an astonishing increase of 171%. Despite the coal price rally, there are a few coal bears hanging around. We lean towards a bearish view ourselves. It’s as though Mr Market is saying “I can’t believe the coal price is going up, but I’d better buy some coal stocks in case it goes up more.” AFR headlines in September tend to support this view. These include: “Panic buying: coking coal prices surge”, “Temporary coking coal rally might hang around for a while” and “New Hope cautious on coal price rally”. Many of the fund manager stars of 2015 have now started buying mining and mining services stocks. Perhaps not so much because they believe their future prospects are bright but because they don’t want to risk not owning them as commodity prices rise. While sentiment is slowly turning positive, it is not quite at euphoric levels yet. The excellent management of South32 and GR Engineering mean our preference is to hold those stocks for many years. In general, though, we have been reducing the Fund’s exposure to commodities. The final lesson, then, is an old one: Wait and see is not an option. Many investors wanted to see a recovery in the coal price before buying coal mining stocks. By the time that happened, share prices had already tripled and more. “Investors hate uncertainty” is something you will frequently read in the financial press. What they are talking about is perceived uncertainty, because the future is always inherently uncertain. Buying when perceived uncertainty is rife has been a very profitable approach.